the pink clutch ...: Lent ... 40 days to a new me! Today is Ash Wednesday ... the first day of Lent. As a child my mother and my Catholic upbringing mandated this time to give something up (which I never understood) and to go without meat on Friday. My meat loathing self always adored this part. It was grilled cheese, fish or pasta all day! Yummy!! I always wondered why we gave something up for Lent and why my mother always chose the thing (chocolate or diet soda) that made her the crabbiest. How was this bettering her life ... or ours for that matter? 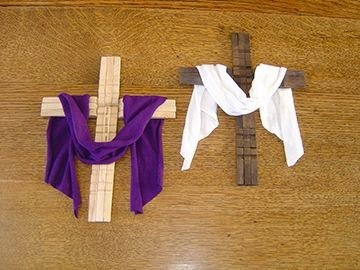 As an adult who has studied the season of Lent I understand it so much more. It now makes clear sense to me why I would be sacrificing something in my life to grow closer to God. The 40 days before Easter that Jesus set aside to do into the desert and fast and pray. The past few years I have given up everything from coffee (yes, I did make a horrible choice) to bread (much easier and felt amazing) to sugar (I eat a lot of sugar peeps) to taking on walking each day. But this year I felt I really needed to do something that would change my life. I had been praying for clarity on what it would be and was still coming up with things that seemed rather silly to me. Yes, I can give up bread, sugar, coffee and wine ... but at the end of the sacrifice I will just pick it right back up again. And how would that really change anything for me. Then it all started coming together. About two weeks ago I was unpacking from NYC and I was struggling to find room in my closet for my new scores. Amazing Kate Spade items that needed a safe location in my closet and they were finding it quite cramped. I got frustrated and starting cleaning out things I knew I had not worn and surely didn't need to keep. A few hours later I had gone thru my sweaters and wovens (button downs) and had a lot more space. I had also found some darling things that I had even forgotten existed in that black hole. I put together five outfits for the week of Valentines, and had a better grip on what I truly owned. It was a great afternoon. I was really excited getting dressed that week. I wore almost a week of items that had either been lone forgotten about or never worn at all. And all of them were well over a year old. Some still with tags. I mean, that is just nuts. And quite frankly ... wasteful! And then Friday night came and I posted a picture of my outfit for date night. And it went viral. More likes on Instagram than any other picture I had posted. More likes than our porch, or bathroom or any other single picture. It was crazy. And it hit me. This was a shirt I purchased three years ago, had monogrammed immediately and then it spent the last three years waiting to be worn. And it was a great shirt. 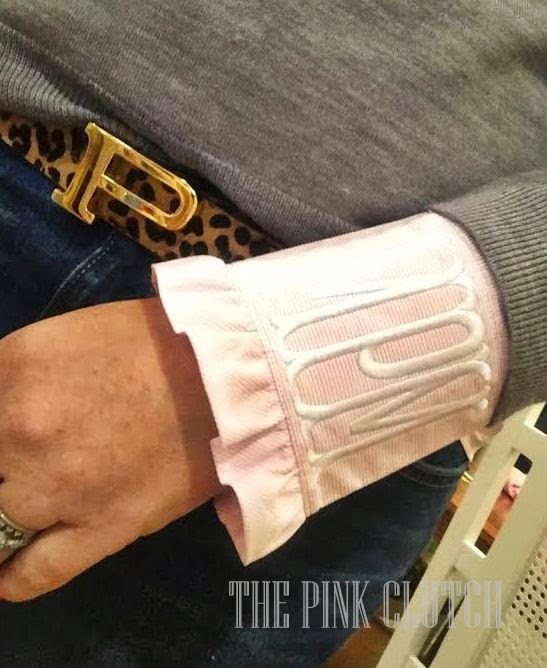 Great pink stripes, fabulous ruffle color and to die for ruffled cuff. How did I forget about this gem? How in the world did I get that way? Buying things that just get lost in the closet or the house for that matter. Am I spending because I like it or am I spending for quality items that I love? It hit me like a ton of bricks. As I dropped off my shirt to the dry cleaner I made a decision. I am giving up spending for the next 40 days. I need to clean out and refocus. I need to make a list of items I truly need to acquire and stop the frivolous spending. The pop into Target and leave $175 later with I don't even know what. It is excessive and irresponsible and must end. No spending on clothing for myself at all. Only buying for the children what they absolutely require in the next 40 days. No spending on items for the house. All my stash in the workroom is organized and listed on Etsy. Every closet and drawer will be scoured and items donated, used or sold. All necessary items purchased from the market or amazon to avoid temptation. Easter clothes styled from things I own. I will take more pictures of what I wear. Clearly you like them! Flower purchases on Monday are an absolute. These flowers literally change my whole demeanor. But I can cut the places I use them in 1/2. I will style things I own differently ... wear them in new ways and with different things! I will be excited about this challenge. I already feel better ... and it can only improve from here! My goal at the end of the 40 days is to be a new me. A cleaner closet, smarter consumer me. Love this Paige. And, love you for sharing so openly and honestly. I think a lot of us can relate to the "too much stuff". Wow. That is an awesome goal. you have a really well thought out plan and I wish you success. Your Target comment really struck a cord with me. I do the same thing. Thanks for the inspiration and sharing. Good luck. And that shirt is fabulous!! Love it!! That totally should've been my Lent sacrifice, buuuut, considering I've already done a ton of online shopping today, I've already messed that plan up! Love it! I gave up the "giving" up ( Haha - not trying to be funny) idea years ago and went to adding a positive so to speak - like not skipping exercise, etc. that was more impactful like your idea. In the last 4 or 5 years I've done 40 Bags in 40 Days and it was an eye opener as to the amount of clutter and stuff hanging around my house that someone else could use or wear. This is a great idea!! Now, I have a question. I was going to post on IG but it was too long. College Girl got an invitation in the mail yesterday that was mailed 11 days ago and it is to a Bridal Shower "Martinis and Monograms' We are now in a panic to find a special gift and ge it monogrammed and because of the mail delay we only have until next Friday!! Yikes! That limits mail order and must be done in town. 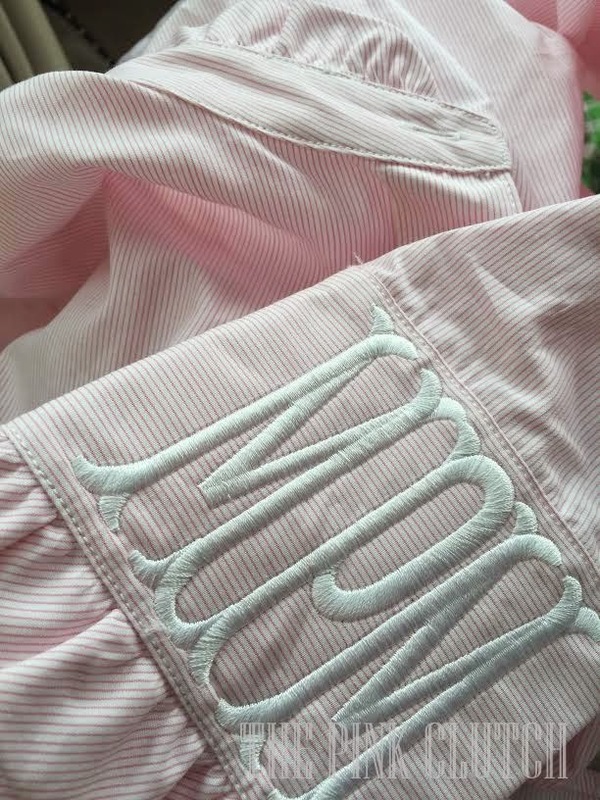 I have a monogram shop I like but they are closed on Saturday ( first day she can get home from college to shop) so I'm looking for any recs on monogrammers in the area whom you've used and like - we can either shop from what they offer or buy something and just have it monogrammed. Got any great local tips??? Thank you!!! I love the items Emily McCarthy has ... in my annoyance with it taking 10 for the invitation to arrive I got wrapped up in time constraints and didn't think about wrapping the picture. We were thinking about a tray so if we find one at Homeggods the College Girl loves I'll give you a shout for that monogram!! Thank you so much!! Great post, Paige! I look forward to reading future posts and seeing your IG! I'm going the old fashioned way this year and giving up sweets (I must lose some fluff so this is a good thing), but your post has me thinking that I should also give up unnecessary spending. Thanks for the inspiration. I'm with you all the way. As for flowers, that's a non negotiable. Gotta have something green and alive in every room in which I spend time. As far as clothes and items for the house, I'm selling my plethora of pretties on ebay. Right now I have cleaned out both of my closets, one of my son's, with his help of course, my collection of coffee table books that are collecting dust, and my kitchen. I feel lighter, free, and accepting of my bad shopping habits. Anyway, we have what matters most or we wouldn't be trying to honor our Lord at all.